The Brazilian Pepper (Schinus terebinthifolius) is widespread in south and central Florida. The sequence of events in the establishment of this exotic tree is one that relates to frugivorous birds. It is a good example of birds dispersing and harvesting their own food supply. Brazilian pepper now covers hundreds of thousands of acres in south and central Florida, as well as many of the islands on the east and west coasts of the state. It is considered the most widespread exotic plant in the state occupying more than 700,000 acres. As the story goes, the Brazilian Pepper was introduced into the United States as an ornamental. The tree has bright red fruits, and shiny green leaves which helped promote it as a popular holiday substitute for holly in Florida, quickly earning the misnomer Florida holly. As far back as 1926 a garden enthusiast residing in Punta Gorda had raised many pepper trees that he distributed among friends. It was easy to propagate them and it was such a good looking plant that soon Brazilian Pepper trees were planted along city streets. It did not take long for Brazilian Pepper saplings to show up elsewhere in the Punta Gorda area. Perhaps mockingbirds and other resident birds took a liking to the berries they later spitted nearby. The larger scale spread of Brazilian Pepper is attributed to American Robins and Cedar Waxwings. 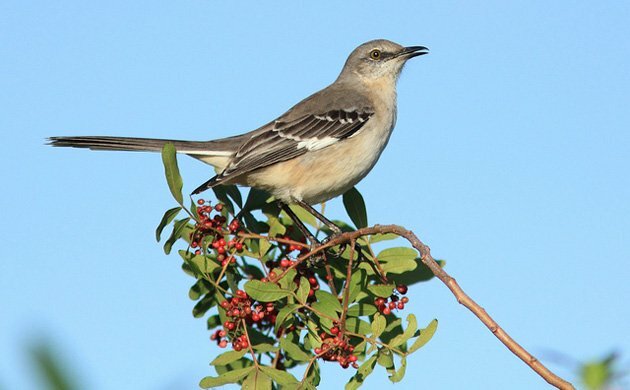 Both species winter in South and Central Florida and unlike mockingbirds, they are nomadic in their wintering grounds. Large flocks of robins and speedy flocks of waxwings appear to be always on the move going on random directions while in Florida. They can be common for a day or so in a neighborhood where they have a feeding frenzy on a pepper tree, then disappear until the next year. As they move from place to place, seeds are regurgitated along the way, hence Brazilian Pepper trees are found, literally everywhere in Florida; including beach fronts where they seem to tolerate the salty ocean spray. 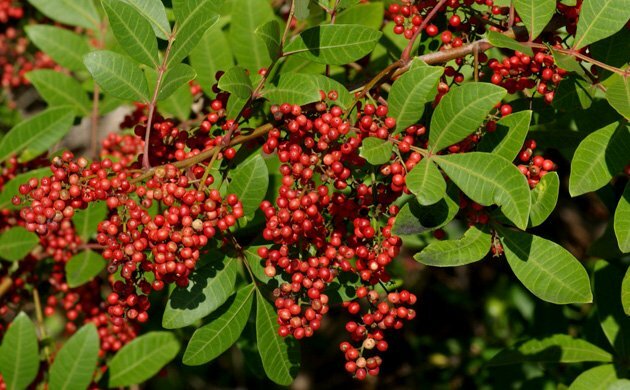 Do doubt Brazilian Pepper is clogging many of Florida’s native ecosystems. Natural areas have periodic campaigns to remove peppers trees many other exotic plants in Florida. However, outside natural areas and with the formidable seed dispersers it counts on, it would be impossible to eradicate the Brazilian Pepper. It is now part of Florida’s landscape and is here to stay. But not all is bad about the Brazilian pepper. 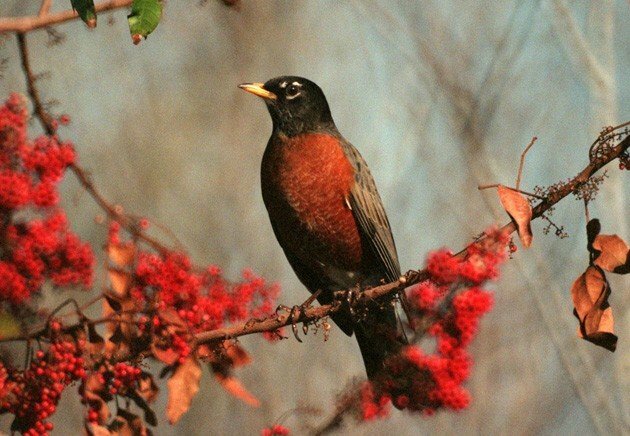 Some resident and migratory birds that eat fruit, rely on Brazilian Pepper berries as important part of their diets. For American Robins, Cedar Waxwings, Gray Catbirds, and other birds South and Central Florida offer plenty of food. For some of the parrots, parakeets, and other exotic birds with established populations in the State, Brazilian Pepper appears to be important for their survival. For the honeybee and citrus industry blooming Brazilian Pepper are key to the well being of bee hives in times outside the blooming period of citrus trees. 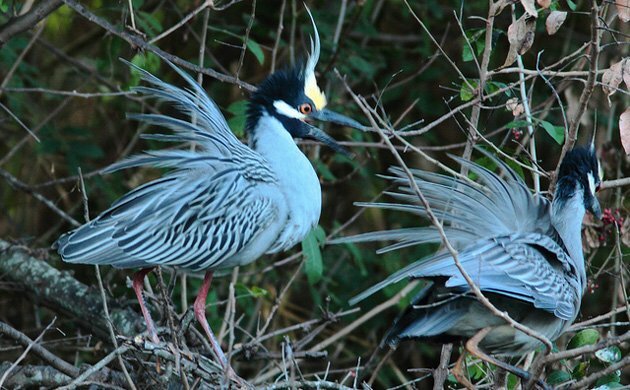 For nesting wading birds, its crooked branches make for good substrate for nesting. Many nesting rookeries in Florida use Brazilian Pepper trees. 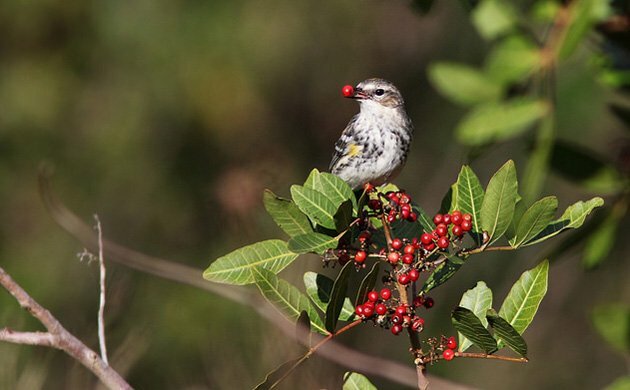 While the Florida Holly is now a tree with ecological functions in Florida’s ecosystems, keeping it under control should always be a priority. Pat, I need ask a favor of you. Pls check you FB inbox in a hour or so. I am curious about the rookeries that use Brazilian Pepper trees, that is interesting! I was wondering if you could point me toward some more reading material to learn about that, or possibly direct me to someone who might be willing to talk with me about it. Specifically I think I’d like to know approximately what percentage of rookeries are made of Brazilian Pepper.